Do you have concerns about productivity and planning, employee effectiveness, stress and burnout, electronic and paper information overload, delegation (a key time management skill) and work/family balance ? We have spent over 21 years studying and developing some of the most practical, effective, and easy-to-implement productivity programs in the marketplace. What’s more, the training material has been constructed in a modular way, so that the participants can get the benefit of rehearsal and follow-up – the best way to learn new habits and improve old ones. View the modules listed below to find out more about each of the training topics. The training modules below are not an exhaustive list of what we can offer. Please don’t hesitate to contact us if you want a course crafted to your specific needs. The NZTE (New Zealand Trade and Enterprise) voucher scheme makes it easier for small business owners and managers (with fewer than 50 employees) to access services that help build their management capabilities and accelerate the growth of their businesses. Eligible businesses are able to use the vouchers to help them pay for qualifying services such as training workshops, courses and coaching. Contact us if you have any queries about using your NZTE Capability Development Vouchers for our training courses. 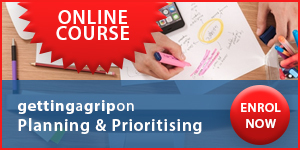 This course equips your team with the core principles of planning and prioritising without trying to force a particular method that is not flexible enough to cater for individual learning styles. You can expect to walk away from this session with powerful examples on how to apply the principles of planning and prioritising. You will be able to fully engage with your diary systems and be more proactive in assessing the difference between the urgent and the important work. You will have the tools to handle ‘stress’ days with increased ease and feel more in control of your life. In today’s flat-out busy world we rarely take time to discuss and brainstorm solutions to everyday time-stealers. This is a very powerful and practical module – you’ll get the chance, with your workmates, to solve specific problems relating to your work environment. You can expect to walk away how to stop wasting time in meetings, manage your inbox, monitor unnecessary phone calls and make your work space distraction free. Delegation is a vital management tool – learn how to use it successfully. You don’t need to work longer and harder, and feel as if you constantly spin in ever-widening circles. Successful delegation will decrease your stress levels and resurrect your feelings of control. You will learn how to delegate effectively and get the buy-in of your associates and staff. And expect to feel the earth move when you learn the oh-so-important skill of how to say ‘No’ graciously! If you are sick of wasting hours in poorly run never-ending meetings this is your chance to wow colleagues with strategies on running meetings effectively and with excellence. Your productivity will soar with Robyn’s easy-to-apply techniques that will change the way you participate in and run meetings. A look at simple, practical and efficient ways of handling the never-ending flow of paper and information in our offices. 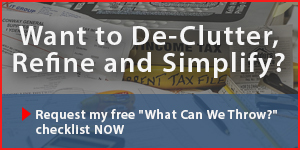 Get on top of the paperwork that seems to control you and learn the key to making your space work better for you. Ever felt overwhelmed by too much mail in your Inbox? Have you noticed how addictive email can be? And have you ever wondered if there are guidelines for email writing – it certainly requires different kinds of responses. This module will help you feel more in control of your inbox and teach you how to stop being a slave to your emails! You can also learn how to manage your time better and increase your productivity by enrolling in one of our Online Courses or Webinars. Our online courses provide you with the flexibility of doing your time management training at a pace, time and location that suits you best! Feel yourself relax under the guidance of internationally recognised time management and productivity expert, Robyn Pearce, and a new-found sense of control as you regain navigation of your schedule and productivity.